KKB Sports Club Kuwait had their 6th Annual meeting at Hi-Dine Auditorium, Abbassiya on 31st January 2018. The meeting was presided by the President Thomas Areekkara and had a detailed discussion on the annual report presented by the Secretary Bino George and the financial report presented by the Treasurer Renju John and the general body passed it unanimously. KKB sports club is one of the leading clubs in Kuwait for the sporting event ‘Tug Of War’ and have a track record of consistent performance in all the tournaments participated in Kuwait as well as abroad. KKB conducted their 1st Tug O’ War tournament in 2018 and the meeting applauded the outgoing committee for its initiative to take up the tournament and the sports committee headed by Convener Philip Areekkara for the successful tournament. The President and the Convener thanked each and every member for their hard work and dedication, without which this would remain as a dream. The annual meeting also elected Office Bearers for the year 2019 – 2020 unanimously. The newly elected committee is headed by the President Bino Payyavoor and the other members of committee are General Secretary: Renice Monippally, Treasurer: Prince Payyavoor, PRO: Sijo Areekkara, Vice President: Jithin Pazhuthuruth, Joint Secretary: Sijin Chullikkara, Joint Treasurer: Joshy Odayanchal, Program Convenor: Mejit Kuruppanthara, Chief Coordinator: Philip Areekkara, Team Manager: Thankachan Kothanalloor, Auditor: Bijoy Karimkunnam and the Advisory Board members: Binoy Muttom, Thomas Areekkara, Ranju Karippadam. 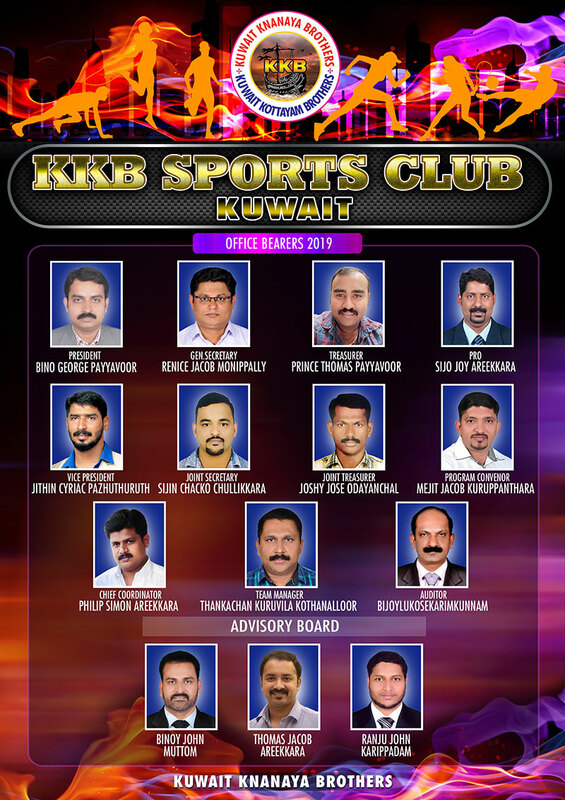 The newly elected President thanked everyone for electing the committee unanimously and requested everyone for their unending support to KKB and promised that newly elected committee shall work out to place KKB the front-runner of sports in Kuwait.